Our services are delivered by a team of professionals leveraging years of experience and who are passionate about developing successful campaigns. Standing out as a recognized voice in your industry. THM leverages its voice on behalf of clients utilizing proven strategies! Bottom line, marketing and promotions is the process of differentiating yourself from your competition. First impressions count and it is essential that you make your brand image unique and appealing to your target audience..
We provide dynamic strategies to ingrain our clients into the entertainment industry lexicon. Check Out Our Past and Present Clients! Chef Ace Champion comes from the great food state of Louisiana. He specialized in Cajun/Creole; the taste of New Orleans. He has over 18 years of culinary experience ranging from Certified Meat Cutter, Executive Chef, Event Coordinator, Personal Chef, as well as Cooking Class Instructor. He is also an honors Culinary Arts graduate of Fox Valley Technical College, one of the nation’s premiere culinary schools. Chef Ace Champion comments, “We should have the same respect for how we prepare food as we do for how we live our lives… Therefore, you not only benefit from the party this food will have with your taste buds but also all the nutritional values that come from live foods as well! Chef Ace Champion cooks with a strong passion and makes it a priority to visualize his entrees while preparing them, so in turn… he can empower others who struggle with cooking. Chef Ace Champion infuses cultures and ingredients to create a flavor that gives you a champion cooking experience and the know-how to cook a little appeal yourself! 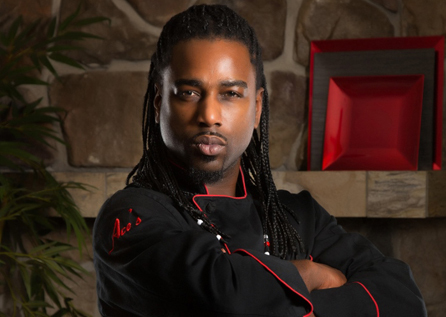 The Law of Attraction & the Power of Positive Thinking are the cornerstone of Chef Ace Champion’s passion for food. He believes that if you think you can be a great chef or cook, then you will realize it, but if you think you won’t be a great chef or cook, then you probably won;t hit the mark as either on. Chef Ace Champion believes that before you hit the kitchen, focus on what you want = like burning it, for example. The result? You’ll serve up a great dish almost every time! Tynisha Keli Soares, professionally known by her stage name Tynisha Keli, is an American R&B and Pop singer-songwriter, hailing from the State of Massachusetts. The daughter of Timothy and Elisa Smith Soares, Tynisha is of Portuguese descent. After suffering tragedy at an early age, she began immersing herself in music at just 8 years of age, and began singing professionally at age 14. In 1999, Keli met Scott Ross (alias Scottie Gee), a former member of the platinum hip-hop group Marky Mark and the Funky Bunch, who agreed to assist her career. He coached her after school, acting as both manager and father figure. Soon he landed her a gig at the Strand Theatre in Boston, where she performed ‘Never Can Say Goodbye’, the Jackson 5 classic, in front of an all-black audience. She moved to Los Angeles a year later and landed a spot in a pop girl group, ‘Gyrlz Society’. Gyrlz Society was an American girl group comprising four members: Amy Correa, Melissa Tessmer, Tynisha Keli, and Katy Scanlan. The group released one single, the group’s only song “Respect Me”, along with a Double “D” Mix, which was produced by Damon Jones in 2002 under MCA Records. Although the single’s casing mentioned a self-titled Gyrlz Society album to be released “later this year” (2003), the album was canceled and the group quickly disbanded. From the beginning she knew that being part of a group was not her desire; she wanted to try it on her own. Before she got a major record deal, she recorded with Beau Dozier a few demos to send to record labels. In 2003, being signed to Warner Bros. Records, Keli worked with Kara DioGuardi, a prominent songwriter/producer. She later started working with different producers including Bryan-Michael Cox, J.U.S.T.I.C.E. League, Tha Cornaboyz, Robin Thicke, and Rico Love. The album was recorded from 2006 to 2008, and was released in Japan in early 2009. It debuted at number 12 at Japan Oricon Albums Chart and sold over 600,000 copies to date, which was a commercial success for Keli. The first single “I Wish You Loved Me” was released in 2007 and the video was released one year later in 2008. The single debuted in Japan at number 25 in 2009. The second single “Shatter’d”, released a few months later, is her first Top 10 song which peaked at number 5 in Japan. In 2009, she covered the song “The Boy Is Mine” (originally sung by Brandy and Monica) with singer Beni Arashiro. Also in the same year, Tunisia appeared often in the 2009 film “Fame”. She co-wrote the song “Powerless”, which was featured on the debut album ‘Exposed’ by R&B-Singer and Def Jam signed Kristinia DeBarge. Tunisia Keli still continues her music career to date, with the release of “Inhale Exhale” and her second single “Romeo and Juliet”; both being released in 2015. On April 14, 2016 she released a new single called “Forget It All” on iTunes and other music services. During the course of her business relationships within the music industry, she met her current manager, Dr. William Harrison, and is currently working on her latest project, “The Chronicles of TK p. II”. HRH Princess Erica Attaa Akua Agyeiwaa Ohene-Bekoe of the royal houses of Banmu and Okomahene in the Kingdom of Akropong-Akuapim, Eastern Region of the Republic of Ghana. She is the natural daughter of the Late Okomahene H.M. King Okomahene Gyamiri III, and the Banmuhemea H.M. Queen Oye Sakyirifa; and niece of the Banmuhene H.M. King Kwame Afari Bampo II; and Okomahemea H.M. Queen Yaa Ofusuahene. 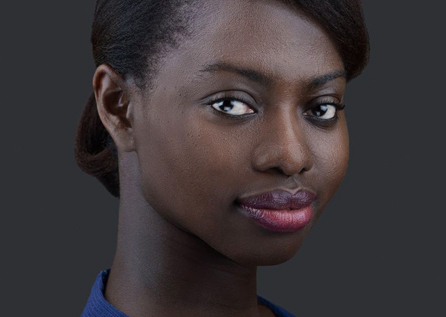 She was born in Ghana, raised and educated in the United States and United Kingdom, and currently reside and work in Stockholm, Sweden as Managing Partner of an International Business Development Consulting firm. She has a Bachelor of Arts in Political Science and Philosophy, and a Master of Arts in International Relations and International Law. Aside from entrepreneurship and business networking activities, Princess Erica is affiliated with several academic, professional, and social societies and charitable organizations, such as the American Pre-Law Association, American Political Science Association, American Philosophy Association, National Society of Leadership and Success, The American Club of Sweden, International Philanthropic Society, Stora Amaranthen Orden (The Grand Order of the Amaranth). she is the Royal Patron/Grande Dame of The Imperial Order of Culture and Peace; and Honorary Royal Member of The International Commission & Association on Nobility. The Princess is very committed to her duties as Royal Ambassador, (in collaboration with the Ministry of Chieftaincy & Traditional Affairs, and the National House of Chiefs, for the promotion and preservation and sustainability of Ghana’s rich royal and cultural heritage through cultivation of strategic partnerships, and investment opportunities, not only for the Royal Institutions, but the Republic of Ghana in part, and in whole. She has been recently appointed as Ambassador at Large for the United Refugee Green Council (URGC), to be the global Consultant and Spokesperson on the Social Welfare and Food Security for the displaced/refugee women and children. HRH Princess Erica has acquired experience working as a Volunteer Reporter for the United Nations Radio (English), and Chief Operation Officer of International Food Security Group, a Sustainable Development and public policy institution dedicated to monitoring global food aid and health security in developing countries in Africa, Eastern Europe, Southeast Asia, South America, etc. The Princess actively supports charities and causes relating to children, women’s empowerment, Cancer, food security, and sustainability, and is a great admirer and advocate of the Arts & Culture. Daja Greer-Wilkerson, known as “Daja Marie”, is a talented Writer, Fashion Editor and singer/rapper/songwriter. Today, she is considered the youngest Fashion Editor on newsstands both Nationally and Internationally. Daja Marie is one of the hottest new songwriters to step into the music and entertainment industry. She is a very versatile singer/ rapper/ songwriter/ actress. There isn’t a specific genre of music that you can pinpoint with her. She raps, performs hip-hop, she’s a pop singer, writes country music, and even sings and writes neo-soul along with acting and writing jingles. Daja Marie has always had a love for music and continues to be exceptionally good at word play. She is a small town girl from Mario, IN but without the small town mentality. She has always been an excellent student, achieving awards, scholarships and landing solo and major parts in advanced choir. At age 16, Daja Marie began writing songs about overcoming obstacles that most teenagers typically don’t experience. 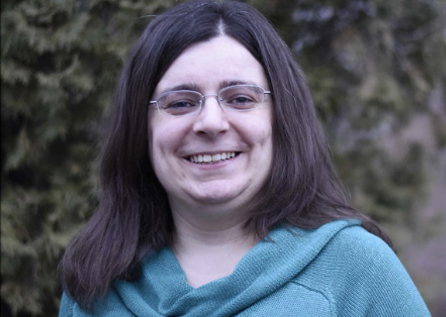 Raised by both her grandmothers and an aunt, she began developing an eclectic and broad outlook on life while being bounced from house to house. Her father committed suicide when she was seven years old and her mother succumbed to drug abuse shortly after, so she was never around to care for her only child. Daja Marie had to grow up very fast. She has always been ahead of her time. She became very adventurous as a teen and what most would call, the life of the party. She traveled, partied and constantly got into trouble, things that she writes about all too well in her music. She was discovered musically when she was too young to know the business and she never received any credit or capital for use of her lyrics and musical talent. Since then, she has worked hard to receive the knowledge needed for the business side of the music industry. Today, she is still constantly traveling and gaining new experiences to increase her brand awareness and network with potential music partners as well as engage with her ever-growing number of international fans. Daja is the current Fashion Editor for The Hype Magazine. She is determined to not stop there. Her songs have risen to the top of the charts from the United States and even to Africa. Her first single, “Daja’s Cold” dropped at the end of July 2013 and became successful. Most people say, “She’s like the female Snoop Dogg,” after listening to the track. 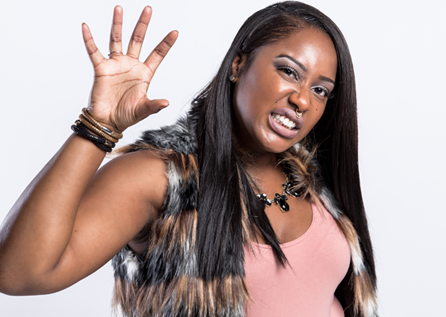 Daja Marie released her second single “Bank Rolls Like Monopoly,” in the spring of 2014. She has recorded a numerous amount of songs in which she plans to have placed on A list celebrity albums and in movies. Daja Marie’s songs reflect her personal stories and she leads a life of excitement that no one could dare dispute. You rarely hear of this girl doing songs full of profanity with no meaning. She believes that you are only as accomplished as the people around you and that your circle begins to change as you grow in life. She hopes to one day become the world’s top Fashion Editor and Songwriter, all the while being a great wife and a business owner. Her ultimate goal is to be a role model for all the young ladies who have endured similar pain that she has felt. With her music you can relate, dance, laugh, and cry all at the same time. Daja Marie doesn’t sugar coat a thing! Nobody’s perfect but she’ll sure make you feel like making mistakes are learning experiences that you can sometimes do without or just laugh about later. Her internal fortitude has enabled her to focus her energy on the positive as opposed to being crushed by the weight of these life-changing scenarios. Her music is the catharsis by which she has healed and now she is fully ready to share her life story with the world through song. – BuzzHUMM’s list of Top 100 Business Bloggers (2015) and Fit Small Business’ Best Small Business Blogs of 2015 & 2016 lists. – 2015 Small Business Book Awards – Community Choice Winner in the social media category. – Member Selection Award (December 2016), Summer Selection Award (July 2016), Peer Choice Award (November 2017), Featured Store Award (June 2016) on ViewBug – Multiple All-Star and Elite achievements on GuruShots. 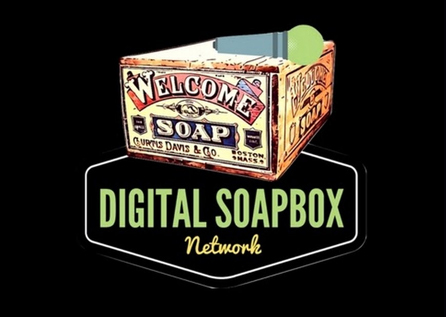 The Digital Soapbox Network is a producer and distributor of digital audio and video content. Formed in 2017, our mission is to provide the very best in on-demand digital content. The purpose of the content we present is to engage, inform and educate the listener. The Digital Soapbox Network’s shows are hosted by some of entertainment’s most known celebrities, journalist and influencers. In 2018 “DSN” signed an exclusive distribution agreement with Entercom. We carefully craft your news announcements in a manner which makes it attractive to media outlets looking for content just like yours. We have a selection of options for you at the right price, so how about starting with something small? Drive traffic to your website get more backlinks and targeting traffic! Let us build your current profile, highlighting your professional attributes and position within your field and society. THM places your news updates in the right hands at the right time! Projects come in on-time and on-schedule. Let us put you in the mix!. Built brick by brick from foundation to steeple by its principals, THM Media Group is firmly entrenched in the entertainment industry as the voice of major and emerging brands. Our team of dedicated and hardworking professionals ignite your campaign and deliver measurable results in a timely fashion and according to schedule.